Starmobile Knight Vision becomes official with DTV-integrated feature using ISDB Technology. DTV will deliver crisp and clear viewing experience in tuning to your favourite TV shows on the 5.5-incher HD phablet, as long as there is DTV services available. Now, you will be able to access channels like ABS-CBN, GMA 7, TV5, ETC, UNTV, BTV, JACKTV and SONSHINE on a mobile phone. Performance-wise, the Starmobile Knight Vision will run on a MediaTek MT6582 chipset with quad-core ARM Cortex-A7 CPU at 1.3GHz speed. It is also supported by a beefy 2GB of RAM for smooth multitasking together with the Mali-400 MP2 graphics processing unit. On the software front, the Knight Vision will be powered by the previous generation Android 4.4 KitKat mobile operating system. This combination of hardware and software is expected to deliver commendable performance and multitasking. Another noteworthy feature of this new device is the camera. It will be equipped with 13MP Autofocus main camera using Sony IMX Exmor RS sensor. The rear camera will also be treated with Optical Image Stabilization, a popular technology which is also associated with the high-end device like the iPhone 6 Plus. It will aid mobile photographers in taking smoother videos and blur-free images especially in low light conditions. Flipping the device, you will find the 8MP snapper to give you nice quality selfies. Considering the capability of Starmobile Knight Vision, it is expected that you will need a considerable amount of storage to house your multimedia files. To meet this expectation, this handheld offers 16GB storage with microSD support of up to 64GB. Other specs include dual-SIM functionality and 3G connectivity. The basic connectivity feature like WiFi, WiFi Hotspot, Bluetooth and GPS with A-GPS are also present. The phone will have a 2,450mAh Li-Ion battery that promises four hours of TV viewing. 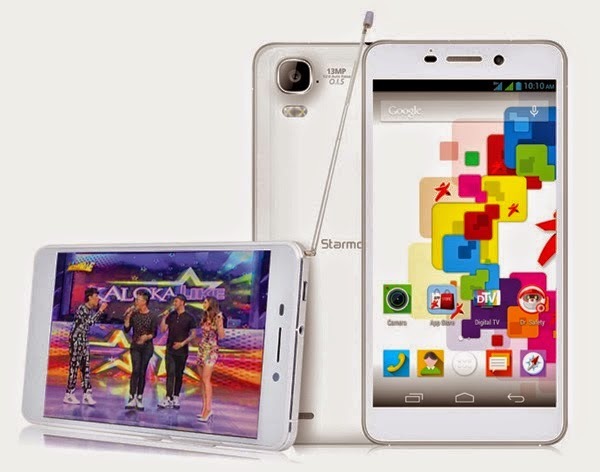 You will have Starmobile Knight Vision for the price of Php 9,990 with screen protector and InstaCase.